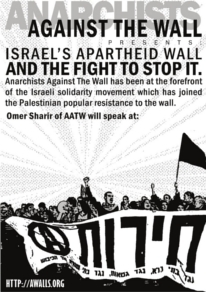 Anarchists Against the Wall's aim is to stop the construction and dismantle the parts of the Israeli wall which have already been built. They have been working very intensively for over six years demonstrating and preparing for direct actions. They have joined dozens of villages all over the West Bank and participated in hundreds of actions. When in the West Bank, their actions are always joint actions with popular committees in Palestinian villages. To date, 19 Palestinians have been murdered by the army for demonstrating against the wall. Countless others, including Israelis and foreigners, have been injured. Some have suffered permanent damage. In addition to the physical risk, activists also face the risk of arrest and imprisonment (see the report "Repression allowed Resistance denied" by Stop the Wall - http://stopthewall.org/activistresources/2019.shtml ). In order to continue the struggle against the wall, AATW requires contributions to its legal fund. It currently faces about 60 indictments and arrests continue on a weekly basis. Omer Sharir, a member of AATW, will be in Europe for a fundraising tour from September 16 to October 24 at the following locations. Please forward this announcement and make an effort to attend the events.